Review: Motherland / It's Just Movies Review: "Motherland"
There are two things that strike the viewer upon entering the world’s busiest maternity hospital. The first is shear rapidity and stamina of the population explosion occuring therein. The second is the age of the mothers giving birth, literally, every minute. Children are having children. The first few minutes of the movie we are in shock, submerged in a world so stridently foreign we are dizzied. Then we realize that the women, in the maternity ward that is as large as a small town, are as out of place as we are. Many are there for the first time, some are there for the fifth time in as many years. They seem to have no better understanding than we do of why they are delivering far more babies than they can support. The staff spends half their time delivering and other time split between teaching new mothers how to be mothers and teaching overburdened mothers how to stop having children. The prognosis is not good. Almost none of these young women will have anything to do with birth control. For the most part, their parents have told them to avoid it. Indeed, to fear it. Clever dialog that permeates the official, and unofficial, clutches in the ward. 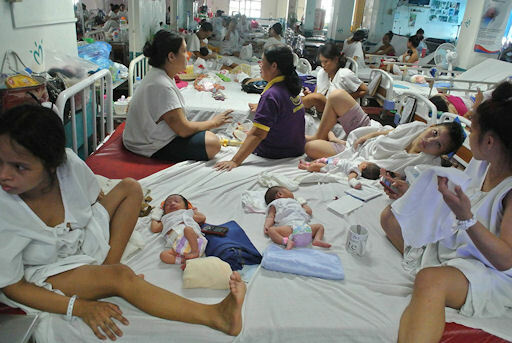 The Philippines is one of the world’s poorest and most populous countries. There are certainly the middle and upper classes, but the working poor and the desperately poor make up a huge share of the population. Their philosophy is stripped bare inside the members only club of new mothers. On the one hand, they are in the lap of luxury. Almost all of them are eating better, sleeping better and having better exchanges with others than they will ever have in their home lives. Even so, they are wracked with guilt over (what else?) getting home and taking their place as wives and mothers. Even though they will witness the deaths of their children, and, in some cases, die themselves at too young an age, each mom cherishes her culture. At the center of that culture is the right, and responsibility to have as many children as possible, as fast as possible, regardless of the ability to feed and house them. The focus on three women, Lea, Aira and Lerma represent a microcosm of the hundreds of moms in the maternity ward. Funny, ironic, dedicated and deeply afraid, their courage emerges in their stubborn acknowledgment of birth control and their simultaneous rejection of it. Not so different than every other person on earth, as it turns out. With about a third the population of the USA packed into a landmass about that of the state of Arizona, this population explosion is reaching a critical point. As the young mother and her mostly unemployed husband load into a motorcycle sidecar for the ride home with their twins, the reflection on the rest of the world is clear. How far can faith alone take us?